Indian Summer is all those things and more.. When was the last time you were handed a leather-bound menu? No, it doesn’t happen to me very often these days either. So many restaurants have taken to presenting their menus on loose sheets of paper or scrawled in chalk on blackboards. I can understand the policy behind that, of course, as it means the kitchen can update the menu quickly and easily, according to whatever’s fresh or in season. It’s also a way to encourage customers to come back more often, knowing there’ll always be tasty new dishes to try. At the same time, however, something’s been lost in this general trend towards menu changeability. When even restaurants themselves can pop up one minute and disappear the next, a menu printed on paper seems to suggest that eating out is convenient and commonplace. This contradicts the notion that dining out is an experience to be savoured and enjoyed as a special occasion. Thankfully, Indian Summer isn’t somewhere to just blithely follow convention. 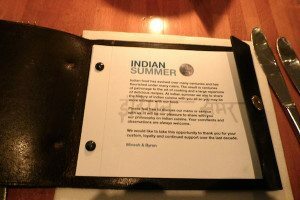 In fact, breaking established ideas about Indian food and how it’s presented and served underpins the restaurant’s ethos. And that alone is something to be celebrated. During my recent visit there I was handed a fairly small, square menu that was a thing of beauty in itself. The cover was made from a lovely leather that was soft, shiny and a pleasure to touch and hold, and the inside pages were filled, not just with enticing descriptions of the food, but pictures and biographies of the key staff, as well as the restaurant’s background story. The menu made me warm to the restaurant instantly – just as the low lighting, cosy atmosphere, twinkling lights and modern décor had drawn me into the place. A lot of thought, heart and soul had clearly gone into the menu’s design and content, and as I browsed through it a sense of excitement and anticipation arose inside me. I felt as if I’d arrived in some sort of exotic, interesting location, had been embraced like an old friend, shown to my seat at the head of the table and was about to be taken on a magical journey through India’s gastronomic highlights. That’s an intoxicating way to feel at the start of a meal. From the restaurant’s glowing reviews, I’m clearly not the only person who finds such attention to detail and customer experience so appealing. 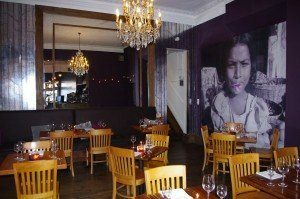 The chefs at Indian Summer have been serving up high-class Indian food since 2001, and in that time have built up an enviable reputation, a loyal customer-base, glowing reviews and a cluster of awards and ratings. For dinner, there is a two-course option for £22.95 or three courses £27.95. Drinks-wise, there is an impressive wine list but my friend and I decided on a lighter option and each had a cider, which was a refreshing, palate cleansing accompaniment to the food. The starter menu comprises dishes that will be familiar to most customers alongside others that have been given a more modern Indian Summer style twist. Having just returned from a five-week trip around southern India, part of me yearned to try the Masala Dosa, which is widely eaten in the region for breakfast or as a roadside snack. I wanted to see how Indian Summer’s version compared to those I’d had in India..
..but was also tempted by the Bhel Puri, another street food snack but from Mumbai and made from puffed rice, gram flour sticks, potatoes, onions, chickpeas and tomatoes with various chutneys made from tamarind, date, coriander, chilli and yogurt. 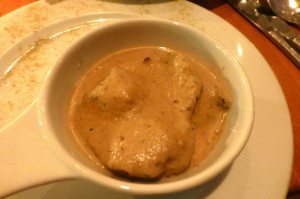 In the end my sense of adventure prevailed and I chose something new – the Amritsari chicken – which is pieces of breast meat marinaded in cardamom, peppercorn and lovage, cooked in the tandoor and then served in a creamy roasted almond sauce. 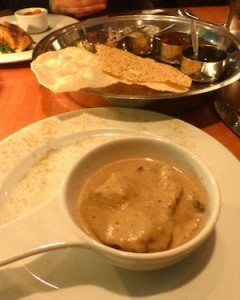 It was everything one might imagine; rich and flavoursome and not dissimilar to other creamy curries you see in the UK, such as Passanda. I enjoyed it very much but it was more like a main course which you might have with rice than a starter. Delicious nonetheless. 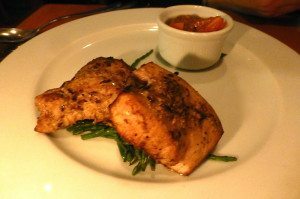 My friend Liesl went for the Tandoori Zeera Swordfish, which had been marinaded in whole ground spices and toasted cumin seeds, served over a bed of samphire with a side of tomato salsa. She was served two big pieces of swordfish that were robust, meaty, beautifully spiced and cooked. The tomato salsa was a fresh and gentle accompaniment, not as spicy as one might expect. For my main I had Lamb Zafrani, which was slow cooked shoulder of lamb in papaya and raw mango marinade, served with saffron sauce and broccoli thoran. 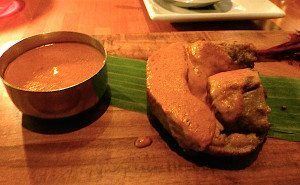 The dish arrived on a wooden board with a banana leaf, which looked great, and the lamb succulent and juicy with a rich, sweet sauce. The accompanying rice and broccoli were much plainer dishes, which brought a welcome balance to the richness of the lamb. Very tasty and satisfying; I’d definitely order the dish again. Liesl chose the Alleppey Prawn Moilee, a popular curry from Kerala in southwest India, which is “inspired by the luscious green landscape and backwaters of Alleppey”. The tiger prawns had been cooked in an onion and coconut sauce, which Liesl said had intense heat that built up in the mouth the more you ate, rather than an initial fiery explosion. The spices created multiple layers of delicious complex flavours, which all good curries should. I tasted a spoonful and agreed it was a wonderful dish. 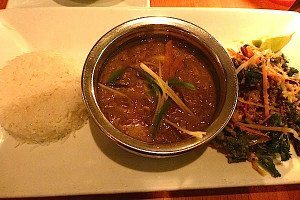 Her accompanying kale, cabbage and quinoa thoran with basmati rice was a fresh counterbalance to the curry, as my side dishes had been. Having tried so many exciting tastes during our starters and mains, we could have been forgiven for stopping there. But the dessert menu sounded far too interesting to pass up, so we decided to share the espresso cheesecake with amaretto crumb. 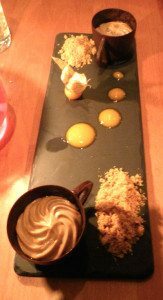 Neither of us expected the visual delight that was put on the table in front of us – a black slate tile with two chilled chocolate cups at either end, filled with swirls of creamy coffee cheesecake, two piles of crunchy amaretto topping with a physalis fruit and purée. It was sweet, rich, decadent and delightful; a perfect dish to share at the end of a superb meal. All of a sudden I understood the restaurant’s name. For British people, the term ‘Indian summer’ refers to an unexpected warm spell out of season – a period of dry, hot weather during autumn that feels like a gift and something to be relished in the present moment. 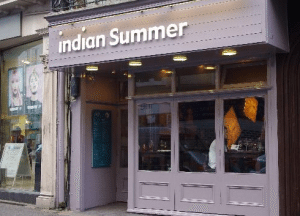 The restaurant Indian Summer is all those things and more; a special occasion, as the name suggests.